It was a more competitive series than many anticipated, but the Cavs were able to close out the Pistons in a first-round sweep. The guys discuss the big winners from the series, including Kyrie Irving, Kevin Love and Coach Ty Lue. … PLUS: An assessment of the Browns’ decision to trade down from the No. 2 spot in the draft – and potentially trade down again on draft night this week. The Browns’ path to a franchise QB got a bit more complicated when the Rams traded with the Titans to jump up into the top spot in the draft. Are the Browns now going to have to engage with L.A. to get their man, or are they better off going in a completely different direction with their pick? Meanwhile, Josh Gordon’s saga shows no signs of slowing down, and the NFL gives Cleveland the most miserable schedule it possibly could. … PLUS: A peak-form LeBron and a favorable draw in the East have the Cavs sitting pretty entering the playoffs this weekend. Look out, Detroit! After feeling left out in the cold by the Indians’ attempt at a make-good for those who had tickets to the postponed opening day game, Travis offers up an easy solution that would have been better for all parties involved. … PLUS: LeBron is looking locked in as the Cavs wind up the regular season, the Warriors are looking – gasp! – mortal, and a few thoughts on WrestleMania. In part 2 of our Indians season preview, the guys take a look at what’s new at Progressive Field this year and what the Indians are doing to draw more fans to the park. 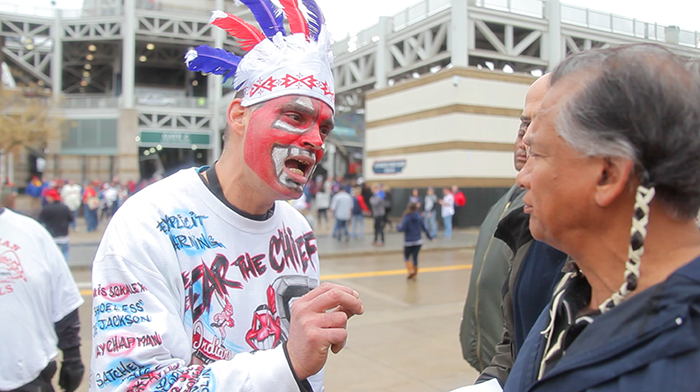 Plus: Sorry, Opening Day Face Paint Guy, but we think it’s time for the Indians to finally bite the bullet and make the inevitable clean break from Chief Wahoo.